The albumins (formed frae Laitin: albumen "(egg) white; dried egg white") are a faimily o globular proteins, the maist common o which are the serum albumins. ↑ Sugio, S.; Kashima, A.; Mochizuki, S.; Noda, M.; Kobayashi, K. (1 June 1999). "Crystal structure of human serum albumin at 2.5 A resolution". Protein Engineering Design and Selection. 12 (6): 439–446. doi:10.1093/protein/12.6.439. PMID 10388840. ↑ He, Xiao Min; Carter, Daniel C. (16 July 1992). 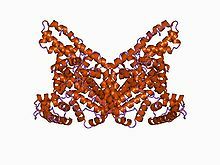 "Atomic structure and chemistry of human serum albumin". Nature. 358 (6383): 209–215. doi:10.1038/358209a0. PMID 1630489. ↑ Pliny The Elder. Historia Naturalis 28, 6, 18. This page wis last eeditit on 21 September 2015, at 01:23.